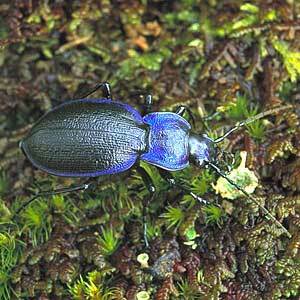 Description: Large (18-30mm) black ground beetle with metallic purple or blue elytral and pronotal margins. A woodland species but very local at lower altitudes and found mainly in overgrown montane dwarf shrub heaths. World Distribution: A European Boreo-temperate species (53), widespread in central, west and northern Europe to just beyond the Arctic Circle. Introduced in North America. Irish Status: Widespread and frequent in hill areas throughout. Ecology: Primarily associated with Calluna heath or forest ecotopes in upland areas. There are few records for land below the 200m contour and these are mainly for the west.